"" Writer's Wanderings: How will we remember? Several years ago, Bob and I went to New York City to see the Macy's Thanksgiving Day Parade. Perhaps the most important thing I wanted to see in NYC next to the parade was Ground Zero at the site of the World Trace Center. We spent the afternoon in the financial district being awed again by the immensity of the tragedy that took place 9/11/01. The rubble is cleared but the empty space is enormous. The subway station is open again and right across from it is St. Paul's Church. This little church with a big heart was central to the rescue operation providing shelter, food, and encouragement. There are display areas set up with remnants of the memorials and the rescue effort for visitors to see. 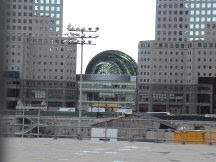 It will not be long before the gaping hole that is in the middle of the financial district of NYC will be filled in with. . .what? How will we remember the day that changed our world? The people that lost their lives? Somehow I think that no matter what the structure, it will be something remembered more in our hearts than in stone.